The red wasp is approximately an inch long, with red all over its body and dark colored wings. Every year the red wasp aggressively defends its nest, and sends some persons to the emergency room. It’s most useful for its killing of other insects, but overall, the red wasp is more dangerous in and around your home than beneficial. If you see red wasps flying around your home, it likely means you have one or more nests on your property. When you have a problem with red wasps and require assistance, contact The Bug Dude, we will take care of the problem for you with professional pest control in Fort Worth, TX. Red wasps prefer areas such as eaves, overhangs, soffits, siding and any crevices around windows. Other locations to watch include inside car doors where the hinges attach, in overgrown areas, garages and under shed roofs. If you have cracks in the siding, they may also nest in your walls. Adult workers and males live on the nectar collected from flowers, and sweet food wastes in garbage cans or in containers, such as a soda can. When outdoors,avoid an open drink, which may attract wasps. Always keep food and drink covered when outdoors. When red wasps, or other pests are ruining your outdoor time, give us a call to schedule pest control in Fort Worth, TX. The nest is a paper-like structure of cells attached to the nest. A small stem is attached to the nest to secure it. The red wasp doesn’t reuse the nest, building a new one every spring. Treating red wasps is dangerous, it’s best to leave pest control in Fort Worth, TX to the professionals. Contact The Bug Dude to schedule treatment. Sealing potential points of entry can’t only keep red wasps out, but also prevents other pests from getting into your home. Use caulking or expanding foam to seal holes in siding, around windows, and other potential entries. Sealing your home and scheduling pest control in Fort Worth, TX are the most effective tools in preventing unwanted pests. Replace or repair torn screens. If you have fruit trees, keep the fruit picked up. Avoid wearing bright yellow, orange or blue clothing. In addition, avoid the use of scented shampoo, hairspray, cologne, perfume and other scented products. In addition, avoid swatting at wasps, which increases the likelihood of receiving a sting. An additional fact to remember is that wasps don’t lose their stinger. They can and will cling to you and sting you repeatedly. Similar to a yellow jacket, wasps will pursue you for a great distance. Also, when their nest is disturbed or they feel threatened, they will swarm, potentially delivering multiple stings. 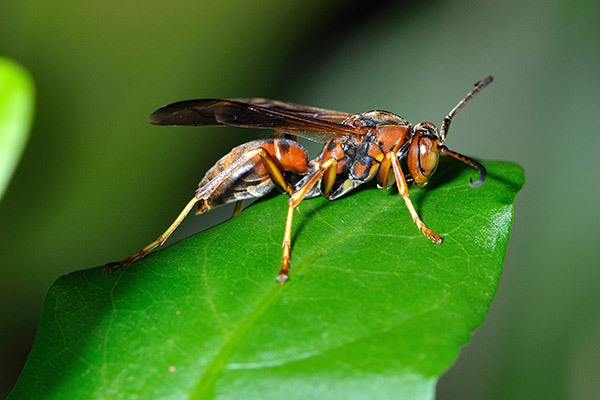 An attack may be fatal, even if you aren’t allergic to their sting, as a nest may contain more than 800 individual wasps. Wasps are active during the day, and return to the nest at night. If you have wasp nests on your property, contact The Bug Dude for professional pest control in Fort Worth, TX. There are a number of different types of wasps, and you may have more than one type. When you call The Bug Dude to provide pest control in Fort Worth, TX, our technician will identify the type or types of wasps affecting your home. Correct identification may affect the program of treatment and prevention. If you find a wasp nest, be sure to keep children and pets away from the area until it’s removed and/or treated. Contact The Big Dude today to schedule pest control in Fort Worth, TX. A normal reaction to a wasp sting is pain, swelling and redness around the sting site. An extreme local reaction involves excessive swelling. For example, a sting on the hand may result in the entire arm being swollen. Doctors recommend you treat it as you would a normal reaction. An extreme reaction should peak at approximately 48 hours and gradually improve in the following days. Anaphylaxis is the most serious and is discussed in the following. If you have never been stung by a wasp before, you are unable to know if you would have a life threatening reaction. Wasp stings are painful, the following tips can help with the pain. Use a cold compress such as an ice-pack. Take an over-the-counter antihistamine to provide relief of itching, swelling and hives. However, never give this medication to children under the age of 2, or to pregnant women, unless your doctor says it’s okay. You may also take an “NSAID” pain reliever such as ibuprofen for the pain. If you have questions, contact your doctor. The allergic reaction, anaphylaxis can occur when you have become sensitized to the poison in the sting. Anaphylaxis isn’t common, but can be fatal. If you have allergies to insect stings, talk to your doctor about a kit containing epinephrine, and carry it with you at all times. If you are bothered by red wasps, or other pests, contact The Bug Dude for professional pest control in Fort Worth. The Bug Dude serves Fort Worth and the surrounding areas.